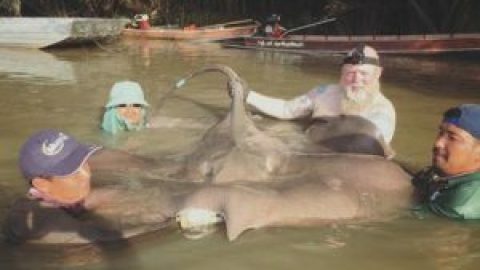 Henry from Germany started his Thailand holiday with a stingray fishing trip to the Maeklong River. On arrival at the Maeklong River Henry was soon fishing a wide section of the tidal river. After a few hours of fishing one of the floats suddenly began moving upstream. On winding down into the unseen freshwater stingray the angler was met by a solid resistance as the rod was put into full compression. The stingray responded with a powerful run before finally coming to rest on the muddy bottom. After moving the boat and applying pressure from above the stingray began moving again. This process was repeated several times in the following hour before the Giant freshwater stingray could finally be brought off the bottom. The Giant freshwater stingray was slowly brought up inch by inch as it glided beneath the boat. On being brought over the net the stingray thrashed wildly before being made safe alongside the boat. The Giant freshwater stingray was measured at a width of 1.95m’s and was estimated to weigh 200kg+. Whilst being handled at the riverside the stingray was observed to be heavily pregnant. Whilst being held in the net the large female Giant freshwater stngray gave birth to a small but perfectly formed stingray. 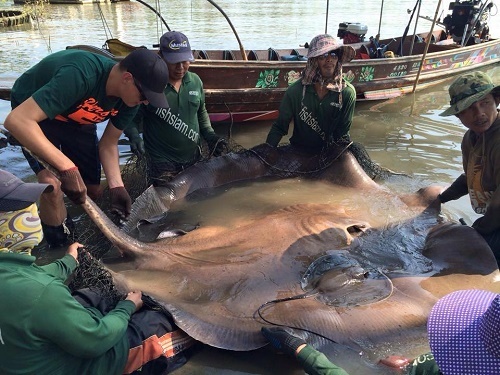 After a short period for recovery both the large female stingray and its newborn were released together back into the Maeklong River.